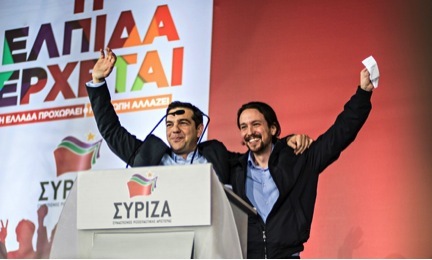 Syriza and Podemos: Indicative of a European Shift to the Far Left? Several months ago, we published an article on the rise of right-wing parties across Europe. While right-wing parties continue to gain influence, notably Marine Le Pen’s nationalist, anti-immigration National Front in France, two extreme left-wing movements have been making headlines early this year: Syriza and Podemos. In Greece’s high-profile general elections the anti-austerity party Syriza won a landmark victory. The consequences of the new government are still to be seen, but Syriza has announced that it will not comply with the bailout agreement or support a “Grexit” (Greece’s exit from the Eurozone) and for restructuring debt within the Eurozone. Meanwhile, Spain, in anticipation of its upcoming fall elections, is closely watching Syriza’s rise. The far-left anti-austerity party Podemos (“We Can”) has gained vast support in Spain and is on track to becoming Spain’s very own Syriza. While Greece and Spain, two of the most economically hard-hit countries in the E.U., show a shift to the far left of the political spectrum, it is unclear whether Syriza and Podemos’ popularity are signaling a European-wide development. What does their rise mean for the future of the Eurozone and, with that, for the European Union? How will Syriza and Podemos influence other economically struggling countries, especially in Southern Europe, and change the political climate? Podemos has primarily focused on riding Syriza’s wave of success. Pablo Iglesias, the party leader, positions Podemos as a sort of sister party to Syriza and continuously addresses their joint effort of democracy winning over austerity. During the final stages of the Greek election, Iglesias tweeted at Syriza’s Alexis Tsipras, current Greek Prime Minister-elect: “2015 will be the year of change in Spain and Europe. We will start in Greece. Let’s go Alexis, let’s go!” During his speech at the Madrid rally, Iglesias animated the crowd: “The Greek people have won in Greece…We need dreamers who dare to defend the poor to fight the rich.” Iglesias shows political cunning with this persistent evocation of Syriza and Greece: associating his young party with the well-established and successful Syriza can only help authenticate Podemos. Podemos is facing several obstacles in its hypothetical rise to power. Like many of Europe’s right-wing radical parties which focus heavily on a nationalist and anti-immigration ideology, Podemos acts more like a movement than a serious political party. Thus far, Podemos has failed to develop stances on non-economic issues. Its potentially low electability is due to the party’s experience deficit and inability to gain support of groups outside of the young, low-wage earners, and intellectuals, such as the large middle class. In aiming to garner widespread support for the upcoming general elections, Podemos is putting efforts into de-radicalizing and “become a catch-all party,” according to Diego Muro, a Spanish political scientist. This, however, could come across as hypocritical as the post-ideological, anti-establishment party becomes more and more like any other party. Despite the lack of comparison between Podemos and Syriza, it is indubitable that Podemos’ success in Spain’s fall elections will be heavily dependent on Syriza’s success over the next few months. The whole continent will be watching Syriza closely. Will it be able to achieve debt redistribution in the Eurozone? Will the EU and economic powerhouses, like Germany, accept Syriza’s demands and be willing to negotiate with the new Greek government? Can Syriza uphold the anti-austerity promises it made to the Greek electorate? This Monday, further talks between the Greek government and Eurozone finance ministers broke down when Greece rejected a six-month extension of its bailout package. This early collapse points toward a lacking interest in cooperation from the new leftist Greek leadership. If no agreement is reached, the Euro will further devalue against the Dollar and Greece will face another severe cash crisis. According to the Reuters, “EU officials fretted about how seriously the novice Greek leaders were taking their finances and how far concerns about semantics and saving political face might trump pressing economic needs.” It appears as though Syriza is sticking to its radical election platform, which could become a threat to the future of the Euro and for its popularity back in Greece. Currently 81% of Greeks want to stay part of the Euro, and the government has to find a balance between saving its political face and responding to economic needs. The course and outcomes of the proceeding bailout talks will undoubtedly indicate the lifetime and popularity of anti-austerity, left-wing movements in Greece, Spain, and Europe.